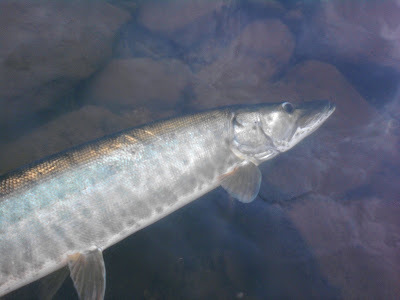 If you've been following my blog lately... you probably know that I have been a little bit fixated on muskies the past couple of months. Unfortunately for me, I haven't been able to catch one all summer long--and not for lack of effort. Well, I had a couple of days off work this past week, and the weather had been very "fall-ish" lately... So I decided to deposit some more time into my musky hunting bank account--who knows, maybe I would get lucky and find a hungry one that was thinking about fattening up for winter. Tuesday turned out to be a beautiful day. The sky was blue, the morning started off cool, and there was a nice breeze blowing that put some decent chop on the water. I spent the better part of the day throwing lots of big, noisy lures hoping to draw some interest a t a nearby lake... And believe it or not, I actually did. 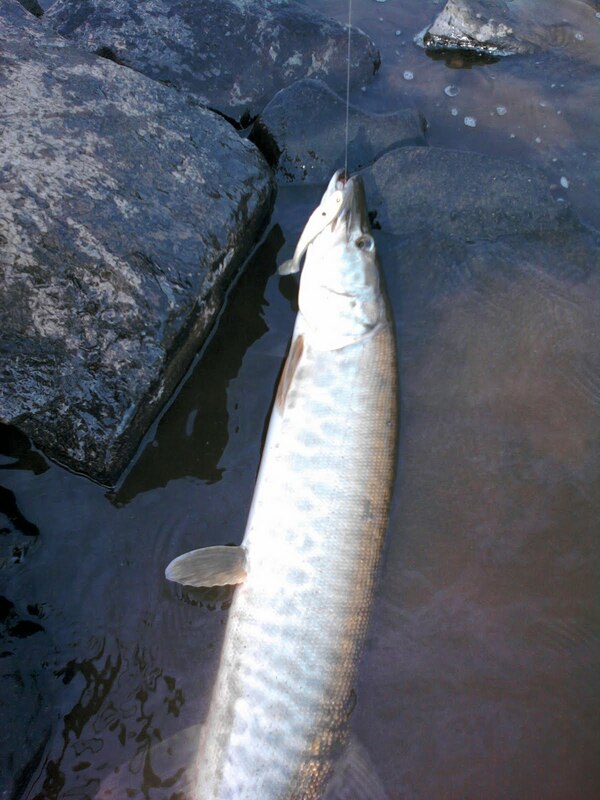 About 1 PM I had a beautiful tiger musky follow a large spinner bait back towards my perch up on the bank. He didn't hit it, but the follow was at least enough to get my blood pumping. I wasn't able to get out fishing on Wednesday, but I couldn't help but think about the nice fish that I had raised the day before... So, when Thursday morning rolled around I was ready to fish! 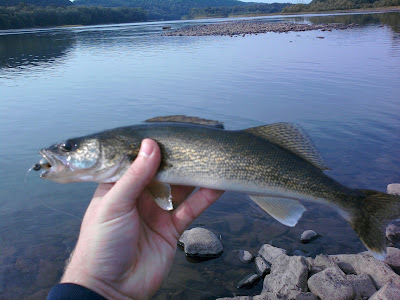 My plan for Thursday was to try a local bass/walleye spot for an hour or two in the morning before returning to the spot I had seen the nice tiger at two days earlier. As luck would have it, I didn't need to return to my previous spot, because I found a nice, hungry-little musky at my first spot of the morning. It wasn't a monster, as it measured somewhere in the 3o to 32 inch range... 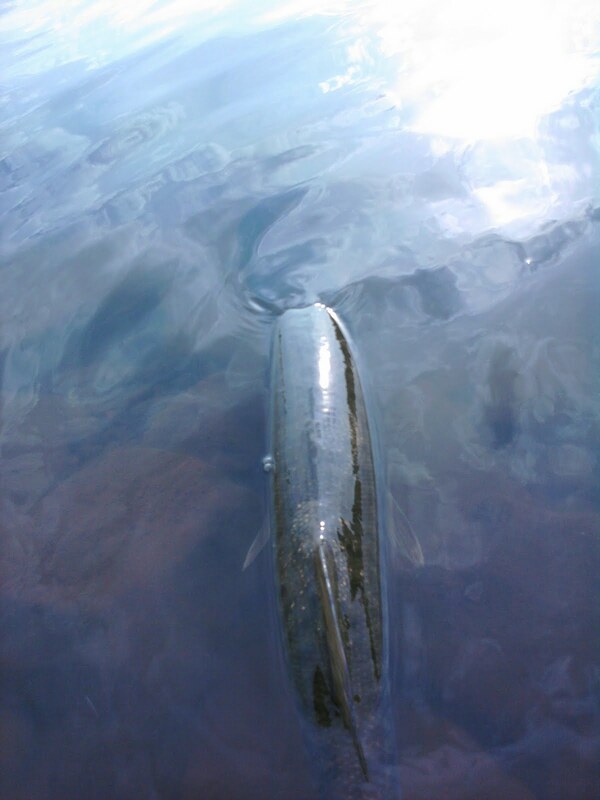 But it put up a very exciting fight (leaped completely out of the water), and I was happy to watch it swim away healthy after the release. FINALLY, some teeth! So the moral of the story is... If you really want to catch a musky, just go walleye fishing. Lol! Obviously, I'm not serious. But it did work for me today... and I'll take it! I wish that I would have had my better camera along (for better picture quality) and that I wouldn't have been alone. Still, it is nice to finally have a couple toothy critter pics to share with you--I have been trying to get them for a while now (but don't expect many more too soon, ha ha). Until next time, thanks again for reading and good luck on the water! Very cool Toby! I like your site. Thanks for the comment Rob! I just checked out your site... Very nice! Looks like you live and fish in a very fun area for an angler. Some very nice catfish you have posted as well. I wish we had some of those big blue cats up this way, like you have in the James. I'll go ahead and add your link here if you don't mind.